Shopping for Big Bang Theory Bobble Heads? Sheldon with a unique Green Lantern T-shirt! Scream Bazinga over this Sheldon Cooper Bobble Head! You'll scream Bazinga over this EE Exclusive Sheldon Cooper Bobble Head! From the hit comedy series The Big Bang Theory, comes Sheldon Cooper! 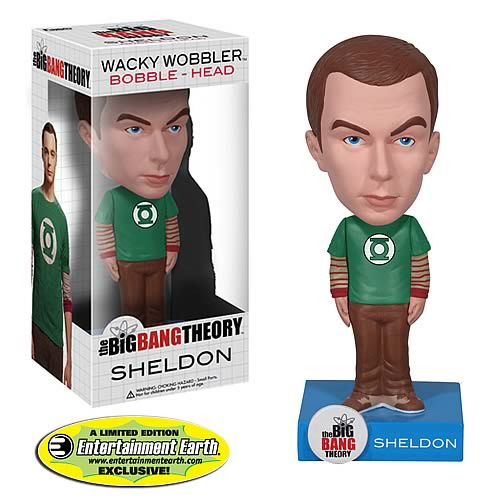 Sheldon comes disinterested, and the Wacky Wobbler features him in a Green Lantern T-shirt with red striped long sleeves, and brown pants. He stands 6-inches tall atop a display base featuring his name. Limited edition size to be determined. Ages 5 and up.